The Chief of Muttahida Quami Movement Mr Altaf Hussain has extended heartiest felicitation to PML(N) candidate Mr Mamnoon Hussain to get elected as new President of Pakistan with heavy majority during presidential elections. In a statement Mr Hussain expressed the hope that newly elected President of Pakistan will play his pivotal role for the promotion of national integrity, stability of the democracy, economic improvement, curbing of terrorism, establishment of better relations among the provinces, ending of load shedding, for resolution of all the problems related to common folk and providing justice to all the masses across the country. 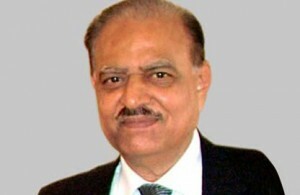 Mr Hussain said that Mr Mamnoon Hussain is not the President of one party or any specific community but he is the president of the whole Pakistan, he is both the President for those who voted for him and even for those who did not vote for him, thus it is expected that as a President he will treat everyone equally. Mr Hussain offered heartiest congratulations to Prime Minister Mohammed Nawaz Sharif, Chief Minister Shahbaz Sharif, all the leaders of Muslim League, all the leaders of religious and political parties, workers and peoples across the country over the victory of PML(N) candidate in presidential elections.